Most IoT devices are using very low-powered components which typically means very little processing power and limited memory to perform complex operations like encryption. The idea behind Speedioe is to provide a simple cypher that could be used even in the most restricted environments. 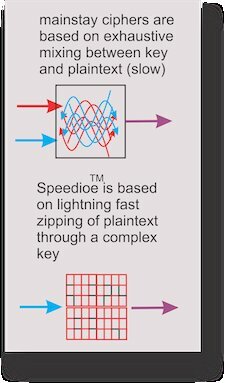 Speedioe™ operates in speeds which are several order of magnitude faster than the fastest mainstay ciphers today. because Speedioe is not based on complexity mixing between the key and the plain-text, but rather on the preset complexity of the key, which when it is constructed in hardware is thousand times faster than what we are accustomed to. While no source code or indication of the how the algorithm works - I am curious to see how it would compare to some more well known simple cyphers like RC4 and its variants, which I have mutated in the past for my own purposes (DRM in my games back on Palm OS). I am actually attending the EIT ICT Idea Challenge during the week and I will definitely like to pick his brains to find out more as he is also presenting at the event. HomeKit - Great start but other platforms?